Before Manny Pacquiao defeated Juan Manuel Marquez in November, his hobbies included womanizing, drinking, and gambling. He even owned roosters he used for fighting. But sometime after the Marquez bout, according to the Filipino newspaper Minda News, Pacquiao began attending Bible study classes—and with gusto. "Hindi maganda na nagse-share ako ng salita ng Panginoon tapos nananakit ako ng kapwa (It's not right that I share God's word and at the same time hurt other people)," he told reporters after gracing the oath-taking of newly-promoted personnel of the Army's 73rd Infantry Battalion in Maasim town in Sarangani. The neophyte Sarangani lawmaker, who already made a good fortune from his boxing exploits since his ring debut 16 years ago, said he wants to concentrate more on sharing his faith and at the same time on helping his poor constituents. "I've gained more than enough blessings these past years so I think it's time for me to return the favor," he said in Filipino. 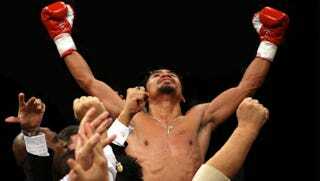 Pacquiao is scheduled to make a defense of his welterweight title by fighting Timothy Bradley on June 9 in Las Vegas. God only knows whether he'll opt out in the meantime.